I am now in my 70th year and this is the first can of SPAM that I have purchased in my entire life. My Mom never fed it to me as a child growing up in Minnesota in the 1950s, even though I was born in 1945, the year World War 2 ended. 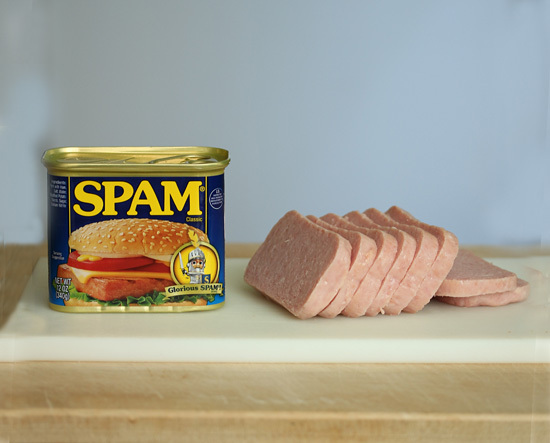 It was during WW2 that SPAM became a world-wide phenomenon, particularly in Hawaii and the Asian Pacific. After the attack on Pearl Harbor in December 1941, Hawaii became the training ground for the war in the Pacific. Hundreds of thousands of soldiers passed through Hawaii, whose military rations contained SPAM, which has a years-long shelf life and needs no refrigeration. It was perfect for a tropical island where most of the food needs to be imported and refrigeration was not widespread. On the mainland, Japanese Americans were placed in intern camps, but one third of the Hawaiian population was Japanese and if all were placed in camps, the economy would have collapsed. Instead the government placed sanctions on the residents restricting deep-sea fishing industries, which were mainly run by Japanese-Americans. One of the important sources of protein disappeared and SPAM took its place, traded by soldiers for delicious local food. Hawaiians discovered how well SPAM went with rice. To this day, they eat an average of six cans per person per year, far more than any other place on earth. When a hurricane is heading to the islands, residents reportedly rush to the store to stock up on three things: toilet paper, rice and SPAM. SPAM was first produced by Hormel & Co. in Austin, Minnesota in 1937. From 1941 – 1945, as part of the Lend-Lease program, along with tanks and destroyers, 100 million pounds of SPAM were shipped abroad to feed allied troops during WW2. SPAM staved off starvation in Japan and Korea, and was the difference between life and death for the Russian Army. 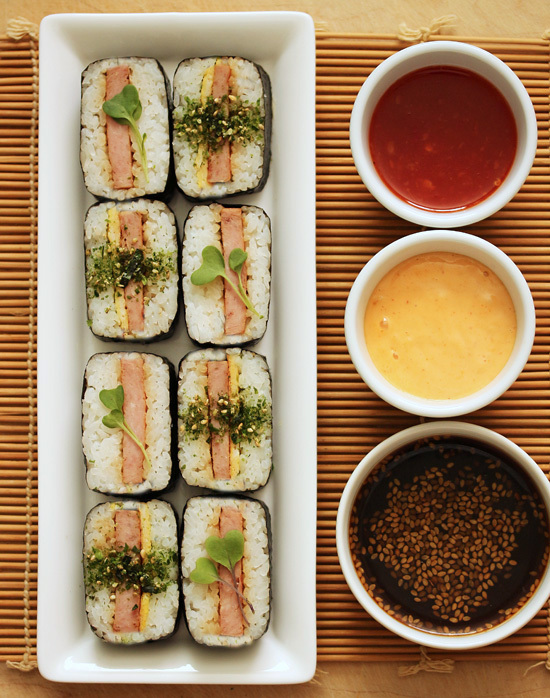 Today, Korea is the second largest consumer of SPAM (the U.S. is number one) where it is seen as a luxury item, packaged in gift boxes for the Lunar New Year. In 1959 the 1 billionth can of SPAM Classic was produced and 2012 boasted the 8 billionth can. SPAM fervor has been celebrated for over a decade at the annual Spam Jam Festival in Waikiki, Hawaii. In May 2015, the 13th year presented food from participating restaurants and food trucks, arts, crafts, entertainment, booths, contests and SPAM merchandise, with over 25 thousand attending. Hawaii loves its SPAM! 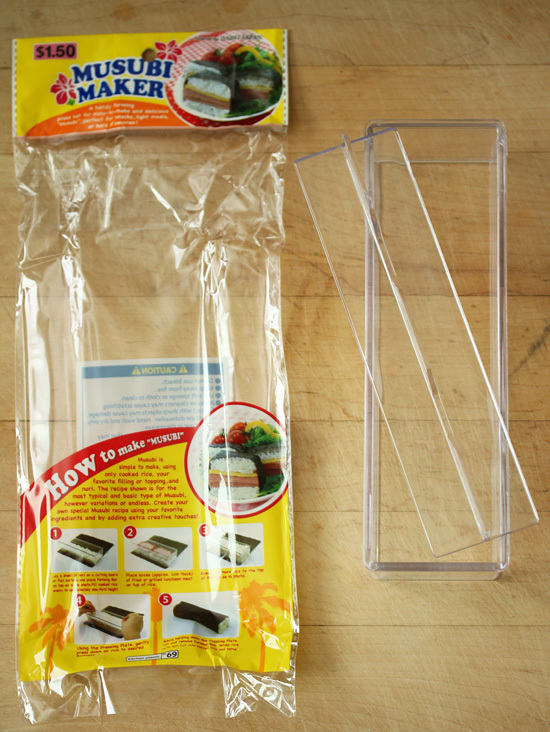 Spam Musubi is so popular that it created a need for a device to easily make it in the proper shape. Thus, the musubi maker. The forms come in single or double length, perfectly matching the shape of a slice of SPAM. The maker has no bottom, so when it is placed on a sheet of nori, the rice is in direct contact with the sheet. When the ingredients are layered in the maker, the separate cover is used to press down and compact the rice, then the form is lifted up and off. Voila. Ready to be wrapped up in the nori, making a perfect rectangular log to be sliced and eaten. Totally ingenious. I bought my musubi maker at Daiso Japan for $1.50. Here you can buy one on-line and see all the different types. First the SPAM is sliced into 8 slices and browned in a non-stick pan. You can add a little butter or oil if needed. When both sides are a little bit crispy, a sweetened soy glaze is added and simmered until syrupy. The glaze is optional if you are making the basic musubi and I added it because I just wanted to go the whole hog on flavor. You know me. The musubi maker is placed on the sheet of nori and a layer of rice is placed inside. It is covered with a generous sprinkle of Furikake, a mixture of sesame seeds, salt, sugar and nori seaweed mince. The SPAM slices are laid on top. Another layer of rice and more Furikake, then the cover is pressed down over all to compact it together. The Koshihikari rice that I used is the stickiest rice I have ever had the honor of sticking to me. Amazingly, it doesn’t stick to the musubi maker. Thank goodness. 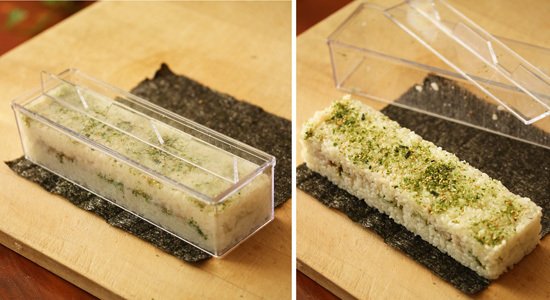 The sheet of nori is molded over the rice block all the way around and the edges stuck together with a little water. I tried to pull the nori away from the rice, but it was stuck permanently. Make sure you make a good fit with the nori, because there is no do-over. Stuck is stuck. At this point you can slice your musubi log into the size pieces of your choice, or wrap it in plastic wrap and chill for up to one day. Koshihikari is the preferred type of premium Japanese short grain rice for sushi. Initially only grown in Japan, it is now also grown in the U.S., which is where my rice was produced. I bought my koshihikari rice at Ralphs Market. If you want to be a real taste snob, buy the bag that says New Crop. For musubi, you could also use Calrose rice, which is more of a medium grain but is sticky. Nori Komi Furikake is a Japanese rice seasoning containing sesame seeds, salt, sugar and nori flakes. There are several kinds of furikake that contain additional ingredients, such as bonito flakes. I recommend using the simple four ingredient style for its simplicity of flavors. Kewpie Japanese Mayonnaise is definitely mayo, but subtly different from American mayo, such as Best/Hellmann’s. Hellmann’s is made with whole egg; Kewpie with only egg yolk. Hellmann’s: distilled vinegar; Kewpie: rice vinegar or apple cider vinegar. Kewpie also contains that umami flavor enhancer MSG. *gasp. Oh no! 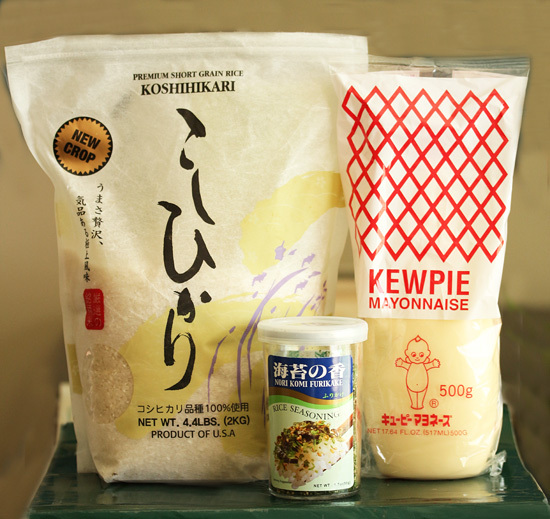 * I got my furikake and Kewpie Mayo at Marikai Market. 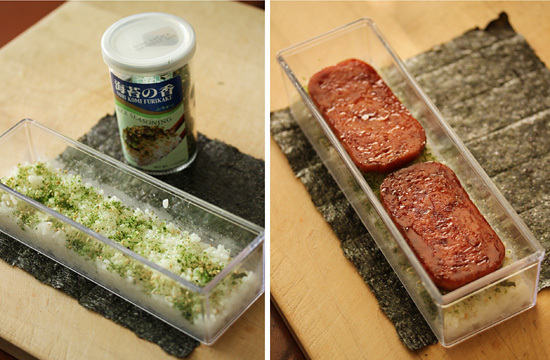 You can eat your SPAM Musubi plain with a good dusting of furikake, or with a tasty dipping sauce. The bowl at the top is Mae Ploy Sweet Chili Sauce. The middle bowl is Dynamite Sauce, which is Kewpie Mayo with sriracha, garlic and sugar mixed in. The bottom bowl is teriyaki sauce, in this case Soy Vay Island Teriyaki, which contains pineapple juice. Yum. Or you can use plain Kewpie Mayo, which is what I used to paint the black plate in the very top photo of this post. 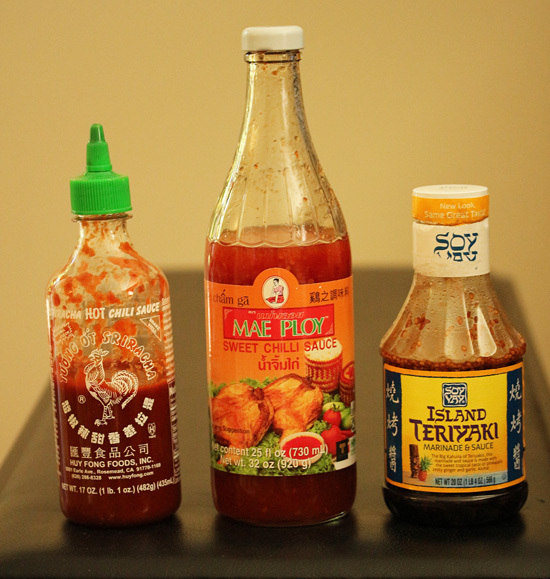 Sriracha, Mae Ploy Sweet Chili Sauce, Soy Vay Island Teriyaki. Just so you can see what the bottles look like. All available at your local markets. Just because musubi is made with humble ingredients, doesn’t mean it can’t be beautiful to look at and delicious in taste. I hope I have given you some ideas about making and serving this wonderful Hawaiian treat. 1. 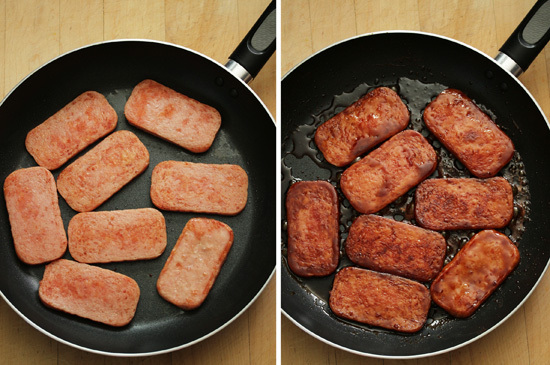 Warm a large skillet, preferably non-stick, over medium heat and add the slices of SPAM. Cook until browned and a little crisp on both sides. 2. (Optional) Add the soy glaze to pan and turn to coat both sides of slices. Reduce heat slightly and continue cooking until sauce is reduced to glaze, turning slices several times. Be careful not to burn. Remove to plastic film covered plate. 3. Lay one sheet of nori, shiny side down, on work surface, longer side towards you. Place musubi press across nori about ½ inch from front edge. 4. Fill bottom of mold with hot rice, using a fork to distribute evenly, to depth of ¾ inch. Sprinkle with about 2 teaspoons furikake seasoning. 5. Lay 2 slices of SPAM on top of rice. Add another ¾-inch layer of rice on top of slices. 6. Place cover of musubi press on rice and press down to compact ingredients together. Move it around to get all the corners. 7. Using the cover to hold rice in place, lift the mold up and off. 8. Bend large back part of nori sheet up, over and around rice log. Bring the short front edge up to overlap nori sheet. Wet edge with a little water to make edges stick together. 9. Using a flat serrated knife, cut musubi into slices crosswise. Sprinkle with additional furikake if desired. Serve plain or with dipping sauces of choice. Mix ingredients together in a small bowl. Chill. How I made my musubi sushi rice. 1. Wash rice 4-6 times, until water is mostly clear. Drain for 30 minutes. 2. Put the water, sake, kombu and rice in a large sauce pan. Let sit for 30 minutes until rice is white. 3. On high heat, bring to a boil. *Cover*, reduce heat to very low, and simmer for 25 minutes. 4. Turn off heat and let sit for 15 minutes. Mix sushi vinegar together in small bowl. Stir until salt and sugar are dissolved. 5. Place cooked rice in large bowl and flatten over bottom. 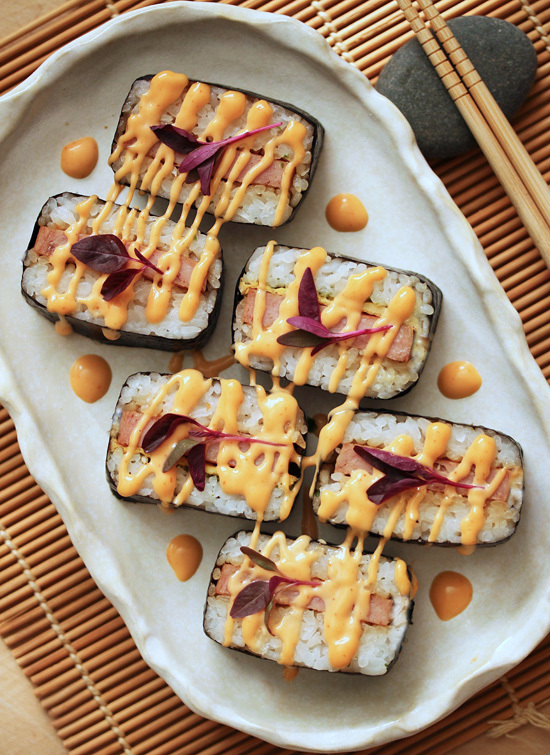 Drizzle sushi vinegar over rice, and cut and turn rice with a paddle or large spoon to incorporate evenly. 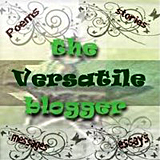 Greetings to you sister blogger. I have not been “getting around” much lately, so it was a pleasure venture into the blogosphere and to come upon this terrific article. I have never bought any SPAM either, but I certainly recall hearing about it when my mom and dad talk about it when “The War” was the topic of conversation. The history you have provided is absolutely fascinating. Thank you! And what a masterful job you have done on your sushi. It is beautiful. Brava! I hope you are having a delightful summer. Gorgeous Photo!!! That is the 2nd time recently I have heard of Furikake…. I think I just might try this….. I wonder if there is an alternative to the nori for wrapping? Hubby would never go near that….. Loved hearing about the SPAM history too… I never realized that …. Hello Lynne and Friends, A L O H A! Your presentation and explanation were spot on! Marukai in Santa Monica is the smaller store. The best and biggest is in Gardena. And Armymum, besides using the Nori, a thin scrambled egg sheet done in a flat pancake pan could be your answer to making the Musubi to your husband’s liking. I’d cut it down the middle and make it a little shorter, not forgetting to lay the egg sheet first upon a clear wrap. The sides will be rice. However, an embellished way is to then lay the Nori sheet over the egg, then proceed. At the end, when wrapping the roll, try using egg white, pressing it down onto a low heated pan to cook the egg seam. Don’t over heat the pan. It only takes 15-20 seconds to seal. Cool at room temperature. And when slicing, I make sure that the sharp knife blade is slightly damp with a damp paper towel, so the rice doesn’t stick and slices are clean. The Musubi with the above condiments and fresh slices of Japanese or Persian cucumbers and carrots make a wonderful appetizer/snack or part of a bento lunchbox! ONO eating! 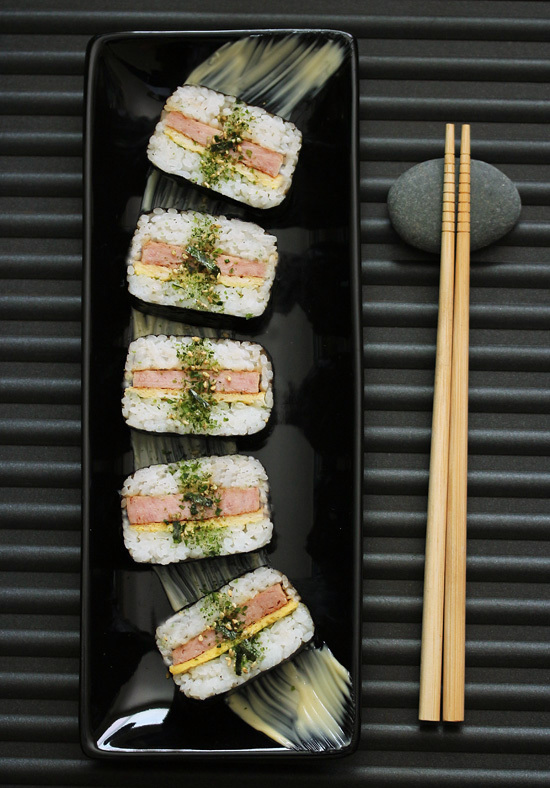 Spam never looked so delicious! I really enjoyed reading about the history of Spam as well. 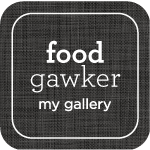 Thank you so much for your interesting research and wonderful recipes!